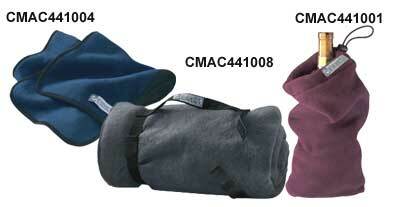 CMAC441008 - Generous sized blanket with matching serged edge. FABRIC: 100% Spun Polyester 380gm Anti-pill Fleece SIZES: ONE SIZE (60" x 80"). Add $1.75/unit for black blanket strap. Available colours: Red, Black, Navy, Royal, charcoal, Green, Maroon. CMAC441001 - Unlined wine holder with black elastic drawcord and cord lock at the opening for easy closure. FABRIC: 100% Spun Polyester 380gm Anti-pill Fleece SIZES: ONE SIZE. Available colours: Red, Black, Navy, Royal, charcoal, Green, Maroon. Imprint: Embroidery - Not included. Call for a quote.